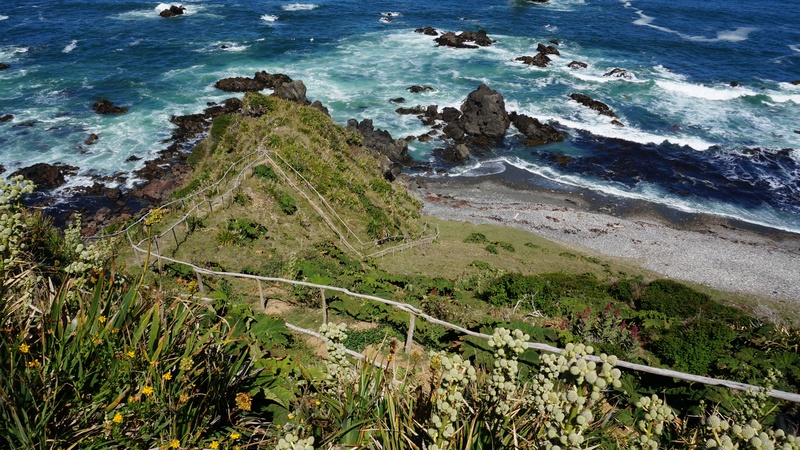 On a free day during our month wwoofing on Chiloé, an island in northern Chilean patagonia, we accepted a ride with some German and Italian tourists staying at the farm to go see the penguins. The drive to Puñihuil was less than half an hour along some beautiful roads. We were lucky to get a ride, though other backpackers we met were able to easily hitch hike their way there and back in a half day. Hitch hiking is quite common on the island, by those old and young! We arrived at the beach, signed up for the next boat launch (~$10 pp), donned our obligatory life vests and boarded. The boat ride itself is only about 30 minutes. It takes you on a short route around two small islands just off the coast. While not the most high octane type of wildlife/boating experience, I appreciated the calmer waters compared with the boat ride we took in and out of Corcovado National Park in Costa Rica! 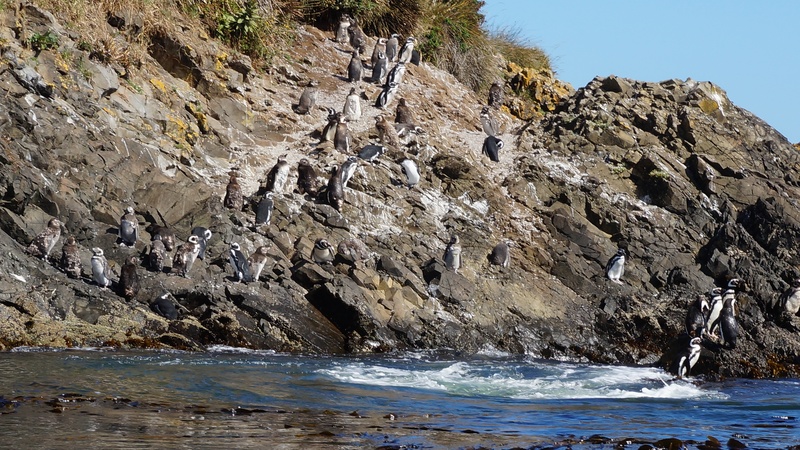 The boat got us super close to the rocky cliffs where hundreds of penguins stood bathing in the sun, or waddling about. It was fun to see penguins in their natural habitat, as opposed to in an aquarium. We even saw a sea lion too! 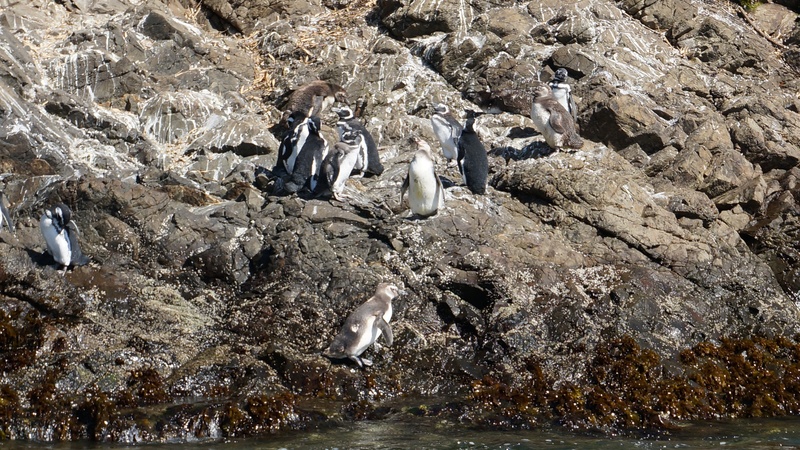 We were very glad to have taken the boat ride and gotten up close to the little guys, but we realized the experience wasn’t as life changing as we thought and thus we would probably be skipping future penguin excursions as we travelled south into Patagonia. The tourists we traveled with then decided to take a short drive around the area to take in some other views from a nearby Mirador (vista/lookout point). We stopped at a stunning spot, right on the coast where a restaurant and campsite provides access to a short hike down to the water. If Jordan and I hadn’t been staying at the farm, we most definitely would have wanted to camp there because the view was breathtaking. 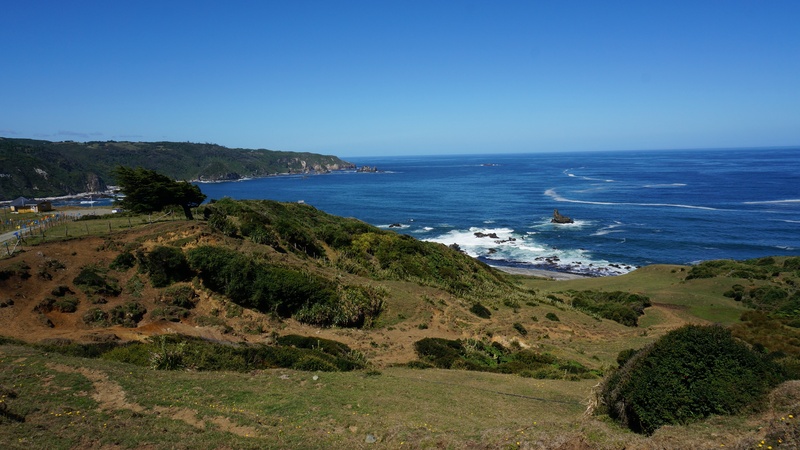 The place is called Fogon Ballena Azul and camping there costs 3500 pesos (~$7 pp). The view became even more stunning when our German companions spotted blue whales off the coast in the distance. We were grateful that they shared their binoculars with us. They decided to arrange a whale watching tour that afternoon and had no trouble booking it the day of. For around $100 per person they had a three hour tour with multiple whale sightings. Though it was out of our price range, they told us it was a great experience and worth it. Has anyone else had any incredible penguin experiences? We would love to hear about it! the yellow building is the restaurant, Fogon Ballena Azul! 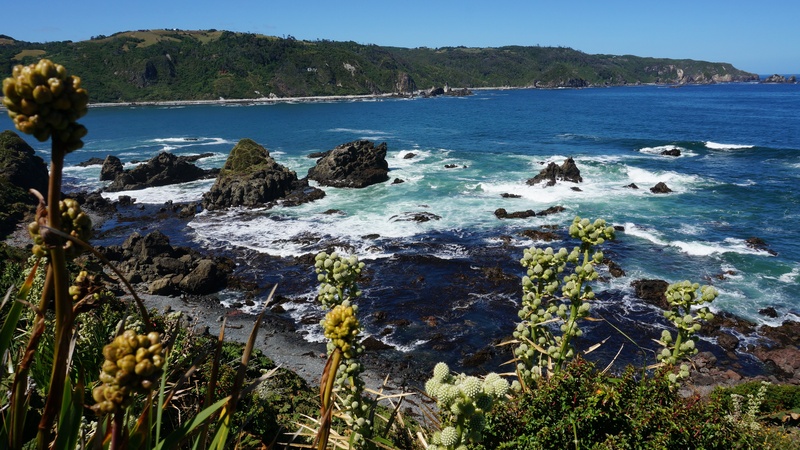 This entry was posted in Chile, Chiloé, Travel Guide and tagged adventure, Ancud, backpacking, boat tour, Budget Travel, Chile, Chiloé, Chilote, Pacific Ocean, penguins, puñihuil, South America, Travel, wildlife, world away, world travel by emmatrucks. Bookmark the permalink.